The chain is keen to expand beyond the Irish capital. 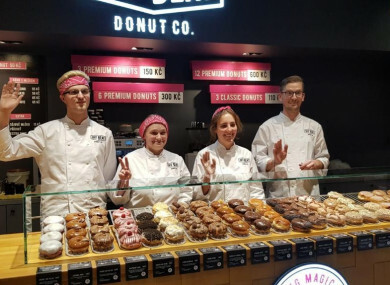 OFFBEAT DONUT CO quietly opened its first overseas location in Prague at the end of last year and is planning more new outlets in the Czech city – as well as Ireland. Speaking to Fora, Offbeat founder Brian O’Casey said that the central European outlet is not only the chain’s first store outside is home country, it is also its first franchised outlet. The doughnut company opened up in 2016 and is owned by O’Casey and his wife. Offbeat now employs some 100 people across seven directly owned stores and three kiosks around Dublin. Last year it recorded a turnover of €5 million. Franchising was always Offbeat’s overarching plan, but O’Casey said he and his wife wanted to wait until the core business got off the ground. “We’ve had a lot of enquiries about (franchising), but we declined them all, primarily because we didn’t think we knew enough,” O’Casey said. “When you open a new outlet, if it’s full production, it’s going to cost about €250,000 or €300,000 (to set up), and if it’s a kiosk it’d be €100,000, so it’s a lot of investment for us over the last three years,” he said. O’Casey said it has taken two years to get the brand to a stage where it was “good enough” to be licensed to other business owners. The move to Prague was on the back of a request from a property investor friend of O’Casey’s, who asked “a good few times” if he could bring the concept to the Czech Republic. “He felt he could bring locations and we would bring the business model,” said O’Casey. For us it’s a big decision as well, we need to make sure that we’re happy that it would work there and the brand will work there. The Czech location opened up in December and since then has been performing well, but “it’s more of a premium product (there) than it is in Ireland – because of the difference in wages and pay scale”, O’Casey noted. “People would buy in smaller quantities in Prague than they would in the Irish market,” he said, adding that he’d “like a bit more volume” in terms of sales. Even so, trade has been growing strong enough for O’Casey to start scouting for more locations in the city, “probably some in shopping malls and shopping centres”. “We do a lot of deliveries with corporate and larger companies, and I think there are opportunities there. I think that’s something that would be new in Prague,” he said. There are also plans afoot to expand further in Ireland, and while Offbeat may open one or two more stores in Dublin, the chain is heavily focused on breaking away from the capital. “Really, we have to get outside of Dublin … We concentrated on Dublin because we were aware that Krispy Kreme were coming onto the marketplace, and it was important to secure good sites and build up a brand presence,” said O’Casey. At this stage we’ve a very strong presence in Dublin, and we’ll be more focused on opening up outlets outside of the Dublin area,” he said, but as the locations are still in discussion, it’s not known yet where exactly. Right now, Offbeat isn’t actively pursuing other markets for franchise opportunities, “but it is something that we will be in the future”. High on the list are the Middle East, the US, the UK and Asia. “The Americans have been very complimentary of the offer, so we’d like to go to America, but the UK is nearby, so we’d like to go to the UK first,” said O’Casey. Email “Offbeat Donut has secretly franchised in Prague - and is plotting more Irish stores”. Feedback on “Offbeat Donut has secretly franchised in Prague - and is plotting more Irish stores”.